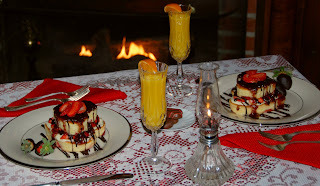 Recently, ILoveInns.com hosted a contest for the top ten most romantic recipes served in B&Bs. So I decided to give it a shot and enter one of my recipes - Delectable Strawberry & Dark Chocolate Stuffed Pancakes. Yes, I am a chocolate lover - even first thing in the morning! I was delighted to find out this week that my recipe, while not winning first place, had been chosen as one of the staff top-ten favorites in this contest. So here is the link to this romantic recipe and a few pictures of the final product.